WHO: MADD Hawaii in collaboration with The Queen’s Health Systems, Hawaii Department of Health, Hawaii Department of Transportation and Coalition for a Drug-Free Hawaii. WHAT: The Drugs & Driving – A Call to Action conference will focus on education, prevention and collaboration concerning the issue of drug-impaired driving among young adults. 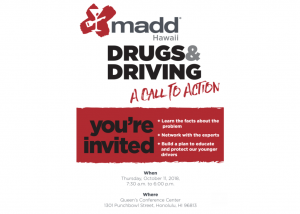 MADD Hawaii will bring together stakeholders to address this rapidly growing issue. The conference will provide an opportunity to hear strategies for outreach which have been effective in other states and to develop local community and policy agendas that MADD Hawaii and community coalitions can undertake over the next several years. Emphasis will be placed on how this issue affect youth and young adults (age 16-28) because increasing numbers of young drivers are being injured or killed on our roads. Drug impaired driving is a more complex issue than alcohol impaired driving. We believe that it is important for all of us in various disciplines to hear the facts from some of the nation’s most knowledgeable resources. WHERE: Queen’s Conference Center, 1301 Punchbowl Street, Honolulu, HI 96813; $5 parking with validation. WHY: In 2015 the National Highway Traffic Safety Administration’s (NHTSA) Fatality Analysis Reporting System (FARS) reported that drugs were present in 43% of fatally injured drivers, many of whom were teens and young adults. This conference will increase awareness about the problem of driving while under the influence of drugs in Hawaii’s younger population of drivers. Thanks to the generous support of our community, there is no fee to attend this conference. Lunch and morning and afternoon refreshments will be provided. Space is limited, though, so please register to attend.